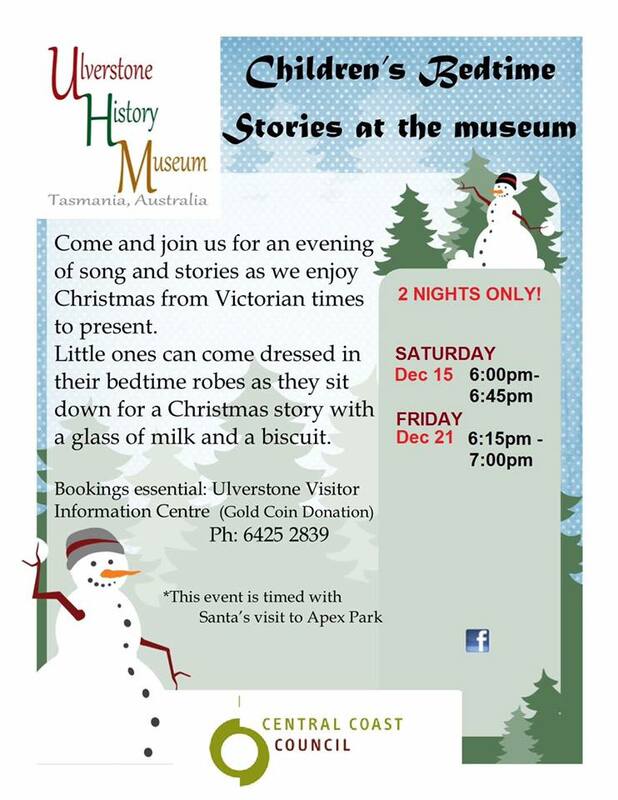 Children’s Bedtime Stories at the Museum – presented by the Ulverstone History Museum, Main Street, Ulverstone from 6.15pm to 7pm. Come and join us for an evening of song and stories as we enjoy Christmas from Victorian times to present. Little ones can come dressed in their bedtime robes as they sit down for a Christmas Story with a glass of milk and a biscuit. Bookings essential by phoning the Ulverstone Visitor Information Centre, 6425 2839. Entry by gold coin donation. This event is timed with Santa’s visit to Apex Park.